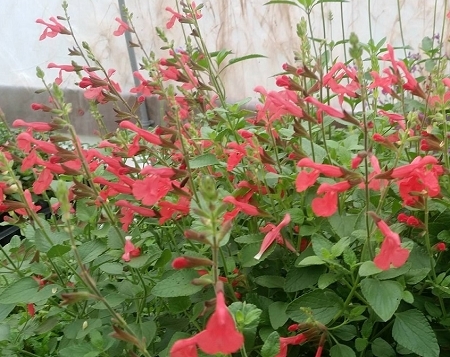 Silkes Dream Salvia -(s. darcyi x microphylla) Dark orange-red blooms attract butterflies and hummingbirds to the garden. Plant is very drought and heat tolerant once established. Tough and hardy plant will quickly form a small bush loaded with flowers blooming over a long period of time from early summer to late fall. Perennial zones 7-10. Live plant in 3 inch container.